Some students are extra stressed this school year, their teachers are asking them to print and are facing issues. Nothing has actually happened to the printers, but the access points to the printers are disappearing. As most students have noticed, all of the computers in the media center have disappeared over the summer. The reason for this change is to reduce the amount of paper wasted on printing. In a meeting with students, Ms. Merriman stated that some of these changes are due to an effort to go somewhat paperless as a building. However, students are going to need to print until teachers stop giving assignments that need to be printed. Most teachers are sympathetic to this issue, and have been using things like turnitin.com instead of relying solely on paper and printing. 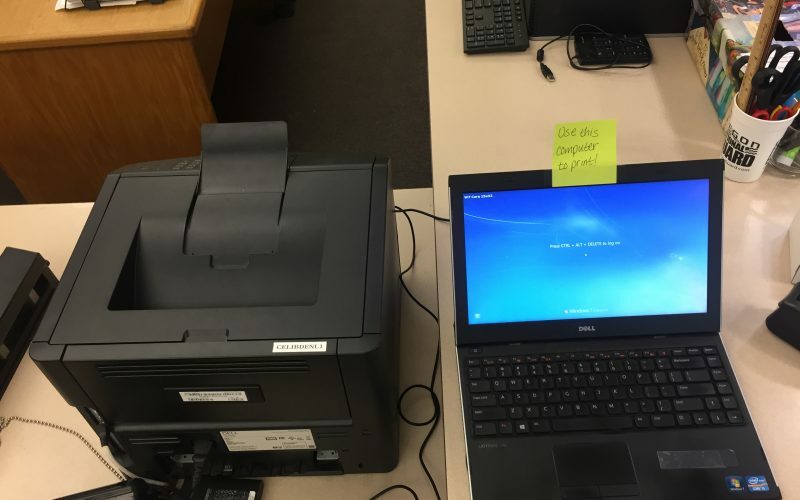 The school is trying to transition to chromebooks instead of standard desktop computers, and this change seems to be adding to the preexisting stress. Many students say that these changes are adding more issues. These changes are taking time for the school to adjust to, despite most of them taking place over the summer. A lot of students are really feeling the pressure this year from these changes. “It’s becoming really frustrating, because in drama we have to print a lot out.” Stated Sierra Nakooka. Another student expressed “I couldn’t print my language arts speech on time due to the printing issues at the beginning of the school year. I don’t have a printer at home so my grade tanked, and it wasn’t even my fault.” Said Sebastian Kirchmann. Again, these issues are possibly not going to be fixed by the end of the school year.